Overall an excellent place to live. The grounds are clean and the rent is worth it. Only thing I would change would be to keep the hot tub unlocked during operating ours. The actual apartment is great- just wish the amenities wouldn’t get locked early almost daily. It’s really frustrating when you’re trying to enjoy the hot tub after a long day and you can’t. We feel safe here, our grandchildren are looking forward to the pool opening, it's nice to know that there are fresh warm cookies waiting for me. have been living there more 10 years it was good experience. Friendly staff and prompt maintenance. Only complaint is neighbors leaves dog unleased. This place is very quiet, the services are buenis, the place is careful. But they take a long time to repair damaged things. I have the stove with a burnt fuse and I told Willis and they have not come to change it. I also need you to wash the carpet and they do not. Have been living here 7 years.. nice friendly staff and prompt maintenance. only complaint need control dog poop.. unleashed dog everywhere.. need to put strict rules. Kiefer, thank you for taking time to leave a review and for being a member of our community for this last year! We are happy that you have loved living here and hope to see you around! Living here as been great so far. We feel safe and comfortable walking around the complex. I’ve noticed lately when I take my dog out to go potty that there isn’t nearly as much dog poop left not picked up as there was before. Hello Staci! We are so happy to hear that you have enjoyed living here at James Pointe! We also are glad to hear that there isn't as much pet waste! We are working on making James Pointe a community our residents are proud to call home! Super nice community, Barbara is wonderful at what she does! She helped us with everything and made the process really smooth so we could move in. Hello Wendolyn! Barbara was excited to hear that she was able to make your moving process a smooth transition!We hope you continue to have a good experience here at James Pointe and we looking forward to seeing you at resident activities! It would be a higher rating if the maintenance would stop blowing leaves on my patio instead of picking them up . This has been an ongoing problem with them . Hi there Cindy! We are sorry to hear about the leaves! We have landscapers that come to maintain the grounds, we will address with them. Please always feel free to reach out to the office and let us know these things so that we make sure issues are addressed! I have resided in the community for almost a year and I still love it! It is quiet, neighbors are nice. I feel secure while walking my dog The staff is friendly and helpful. Hello Elizabeth! Thank you for taking the time to write us a review! We are pleased to hear that you have been with us for almost a year and still love it! We strive to make our residents feel at home and have a sense of community. Hopefully you will continue to be a resident here at James Pointe and we will get to see you at the up coming summer activities! Staff is great and helpful. Love the layout of the apartment and design. but neighbors dont know how to respect quiet hours.🌙✨ And I have work early in morning ☀️some days. Please address this with my neighbors. Hope the stuff on grass gets racked up enjoy walking barefoot on grass. 👣🌱 I'm glad staff care and want to make the residents happy it's nice to know that. Hi there Amanda! We sure appreciate you leaving us a review! As the warmer months are approaching, we will be sending out a reminder notice of quite hours and for residents to take advantage of our animal stations to clean up after their animal. Please always feel free to reach out to us in the office with any feedback, whether positive or corrective so that we can continue to build our community! James Pointe has been a great place to live so far. I don’t like that residents don’t pick up after their dogs. I step in dog poop almost daily which I hate. Hi Virginia! We are happy to hear that you've enjoyed living here at James Pointe! We definitely understand it can be frustrating to step in animal poop, we will be sending out a reminder for our residents to take advantage of the animal clean up stations around the property so that we can maintain a clean community for everyone! Thank you for taking the time to leave us a review and we appreciate the feedback! Grounds are always clean and well maintained. Apartments are older, but include new floors, clean carpets, and fresh paint. Lots of dogs in the community, only been woken up by barking once. Adyson! Thank you so much for leaving us a review! Reviews are an important part of helping us to find amazing residents to add to the James Pointe Community. We always appreciate feedback, whether positive or corrective! We will be sending out a reminder of quite hours to our residents, this includes our furry friends too! I love it here! We have now been here for 6 months. I love how clean the grounds are and the staff is extremely friendly. I plan to live here for quick some time. Hi there Patrick! Thanks for such an awesome review! 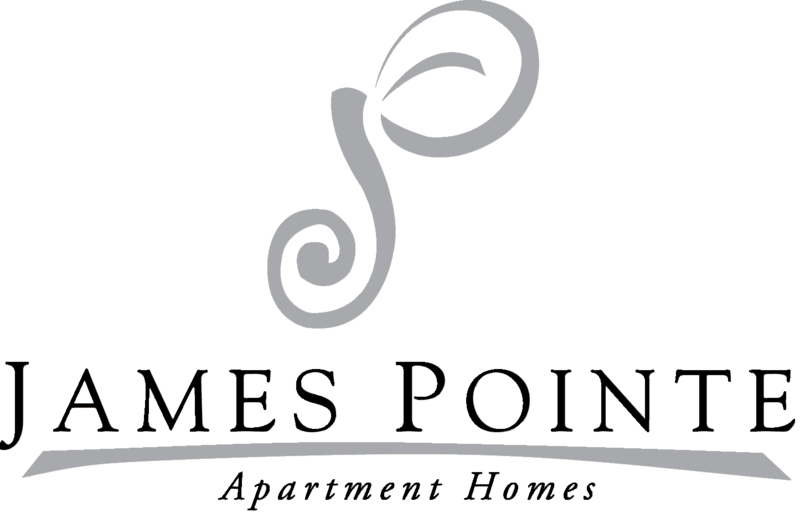 We strive to make James Pointe a place our residents feel safe and appreciated! We look forward to getting to know you and will hopefully see and get to know you at resident functions! Staff is great and always willing to assist you. Have been living here for over 3 months now and never had an issue they couldn't fix right away. Mirella, thank you for leaving us a review and for joining the James Pointe Community. We are ecstatic that you have had a good experience and we look forward to getting to know you! Hi Tammy! Thank you so much for leaving us a review and for being a part of the James Pointe Community for the last year! Hopefully we will be able to continue to provide a great experience for you! After six months this place is still a great place to be. Rent is reasonable and relatively quiet for being so close to the highway. The gal at the front desk is very friendly. With a package holding service at the front office it makes it very convenient and stress free to order things online. Benjamin! We are pleased to hear that you like it here at James Pointe and are having a good experience. Also that you find the package holding service convenient! We look forward to getting to know you and seeing you around at our resident functions! I had a great experience getting signed up and approved by James Pointe.....Barbara was extremely helpful and was able to answer all my questions! Looking forward to becoming a resident of this apartment complex. I have relocated from Pinellas Park FL and just arrived in Murray about a week ago! Hello! We are are so glad to hear that so far you have had a good experience here at James Pointe! Barbara was happy to hear that she was able to be such a help to you! We look forward to having you as a resident and getting to know you! It's a nice quiet place to live. It's convenient to buses and trains. Freeway access is very convenient. There is ample parking and uber comes quickly here. It's very convenient to the mall and restaurants. Hello and thank you for your review! We love James Pointes convenient location as well and are so glad you do as well! I have been here since 2015, the neighbors are friendly. You can go for walks at night and feel safe here.not any drama like you would find at other places. Hello RoAnn! We are happy to hear that you feel safe here. We strive to make James Pointe a place where our residents feel safe and at home. Thank you for being a resident with the James Pointe community since 2015! My fiance and I have loved living here. The staff is so friendly and shows they care. We always know that we will be taken care of. The workout facility is so convenient and our kids love the pool. Hi there! We ecstatic to hear that you love living here at James Pointe and that you feel our efforts to make James Pointe feel like a community. Keep an eye out for the pool opening flyers! We are planning a special event at the end of May to celebrate!